Update: Police have completed investigation work on M56 following a collision earlier this morning. 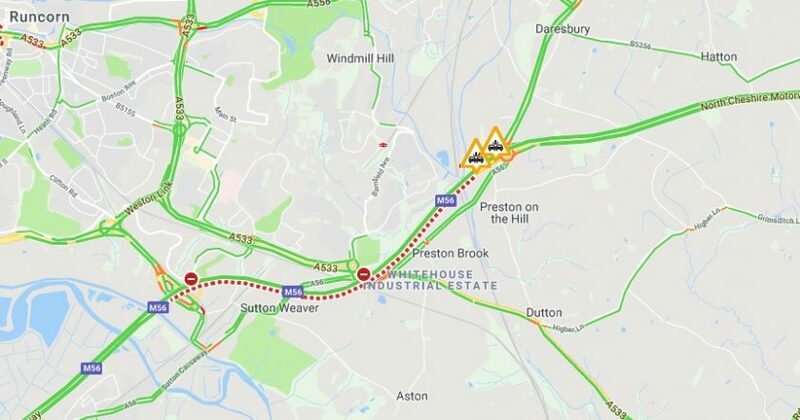 Previous report: Police have closed the M56 Westbound – heading towards North Wales and Chester from Junction 11 Preston Brook to J12 Runcorn due to a serious collision. The incident, which was first reported at around 5.25am is understood to involve lorry. “Trapped traffic has been released and its most likely the carriageway will remain closed for some time for police investigation works to be carried out.” A local traffic report states. ***UPDATE**** M56 will remain closed until at least mid morning between junctions 10 and 12 . Please avoid the area. A diversion in operation from J11, via the A56 Northbound, the A558 & A533 (near Runcorn) Westbound & the A557 South, to return to the M56 at J12. Those heading Eastbound on the M56 – away from North Wales and Chester are not affected.